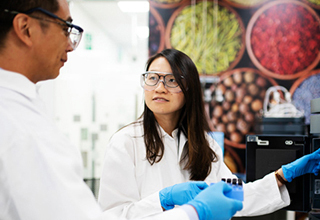 The IFWRC provides laboratory, sample prep and office facilities to enable cutting edge research into food and environmental concerns that researchers are otherwise unable to resource in their own organisation’s infrastructure. We look for projects with specific and testable hypotheses, and that have the potential to deliver benefits to human health and well-being. Project owners can utilize the lab independently or enlist the help of our onsite specialists in many ways. If visiting scientists are not familiar with the Waters instrumentation on site, our team will provide training to help our clients become confident users. They can also remain on hand to assist in a practical capacity throughout the project. Our scientists are specialists in the fields of food and water research too, and can be requested to contribute to the research with practical, methodological and collaborative input. They can help to develop bespoke workflows that utilize one or multiple Waters platforms to achieve the goals of the research. 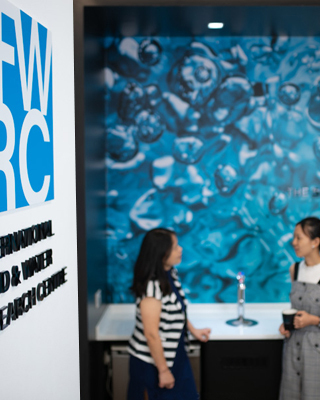 By working with the IFWRC in a collaborative model, project owners can benefit from the extensive expertise our team has in both the instrumentation and data interpretation models available at the IFWRC, as well as from their experience in developing research programmes of their own. There is no one-size fits all support model at the IFWRC; we provide flexible support that adapts to the needs of each different user and project team. There are many ways that projects entering the IFWRC can be funded. These can range from fully funded, through joint funded, or by 3rd party national or global proposals. The IFWRC supports all options and the scientific advisory panel will help to make recommendations. Ultimately, a specific agreement will be defined for each project.